Citroen DS5 Hybrid 4 | What Car? Citroen and Peugeot share the same hybrid technology. The Citroen DS5 Hybrid4 is an executive car that's extremely refined and has looks that will make it stand out from the crowd. The hybrid drivetrain combines a petrol engine – that powers the front wheels – with an electric motor that drives the rear wheels. Around town the DS5 Hybrid4 can run on electric power alone for short distances, which further improves refinement. Inside, front occupants are well catered for with plenty of space and an airy cabin. Those in the rear aren't so lucky because rear kneeroom is surprisingly tight. Boot space is also restricted by the battery and the electric motor that's mounted on the rear axle. All DS5s come with cruise control, keyless entry and start, dual-zone climate control and Bluetooth. D Style trim adds sat-nav and part-leather upholstery, while D Sport models get full-leather upholstery, electric seats and xenon headlights. 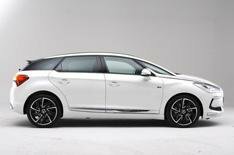 Prices for the DS5 Hybrid4 start at £28,100, making it an expensive option. Running costs will be low however, with average economy of 72.4mpg and CO2 emissions of 102g/km.